The index opened flat but stayed weak for most part of the day and closed weak at 8638.50, loss of 27.80 points. The broader market was negative with 716 advances to 911 declines. Range at the start of series stays at 8500-9000. 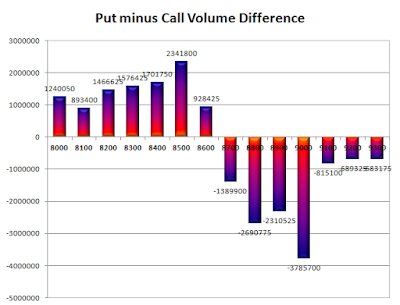 Call option 8700-9300 added 19.23 lacs OI with short covering at 8600 and below strike prices. Put option 8700-8000 added 19.31 lacs OI with short covering at 8900 strike price. 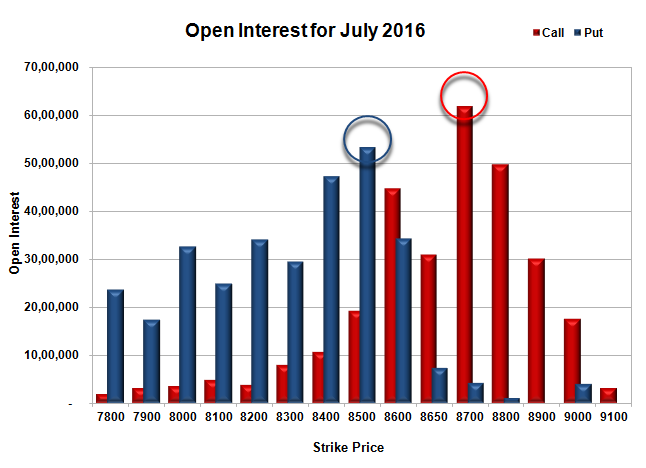 Nifty Open Interest is at 2,21,76,150 up by 3,23,775, with decrease in price, most probably short build-up. Bank Nifty Open Interest is at 17,27,880 up by 19,520, with decrease in price, most probably short build-up. FII’s bought 1452 contracts of Index Futures, which includes net 2491 contracts long build-up and 1039 contracts short build-up, with increase in net OI by 3530 contracts, includes 31026 longs to 29574 shorts for the day. 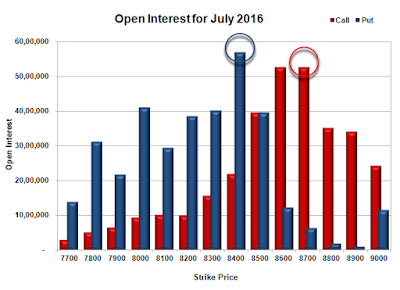 FII’s Index future open contract as on date is 251608 Longs to 33864 Shorts, Net long 217744 contracts. 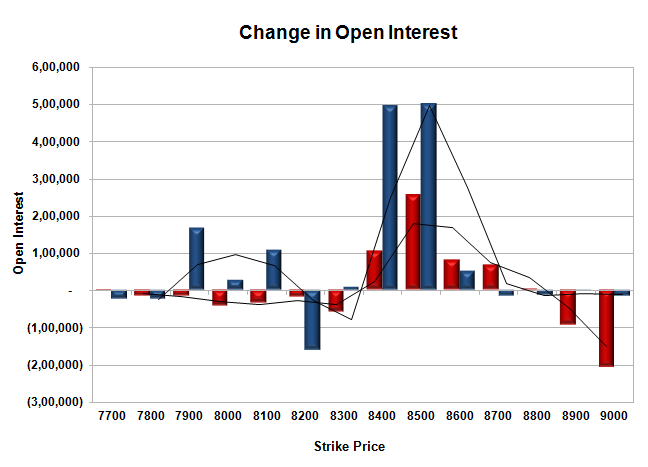 Initial support at 8600, with OI of 26.20 lacs and below that at 8500 with OI of 39.09 lacs. 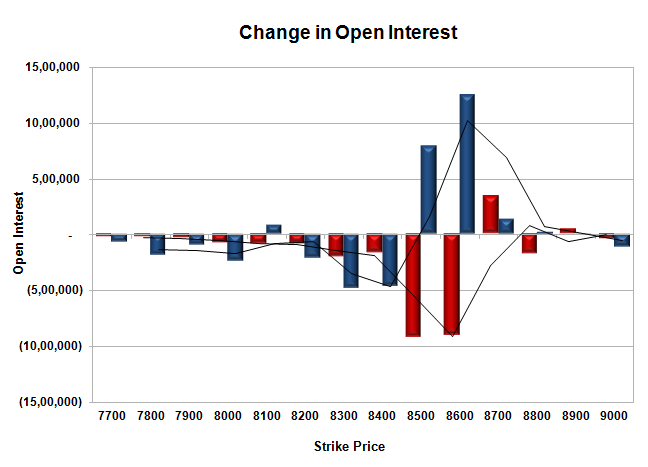 Initial resistance at 8700, with OI of 27.34 lacs and above that at 8800 with OI of 32,61 lacs. 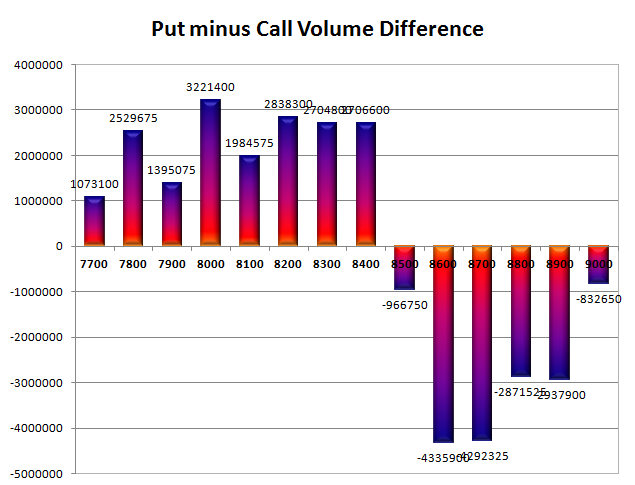 Day Range as per Option Table is 8574 - 8697 and as per VIX is 8571 - 8706 with 8647 as the Pivot. The index opened positive and stayed strong for the entire session of trade with short covering near the end pulling the index to new 52 weeks high to close at 8666.30, gain of 50.50 points. The broader market was positive with 893 advances to 704 declines. Range at the start of series is at 8500-9000. 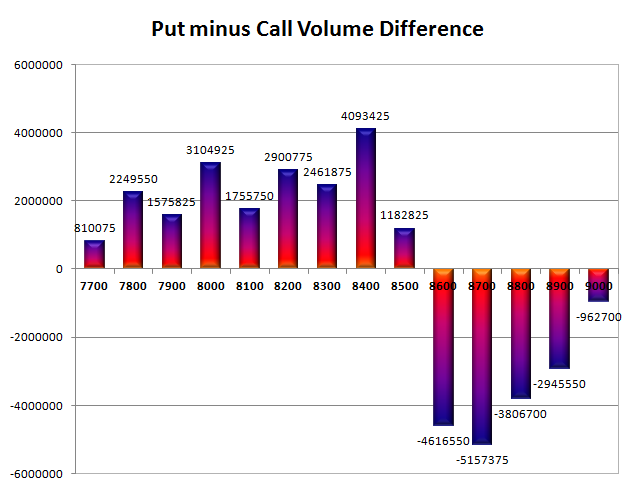 Call option 8000-8900 added 46.75 lacs OI. Put option 9000-8000 added 46.95 lacs OI. Nifty Open Interest is at 2,18,52,375 up by 41,15,400, with increase in price, 100% roll-over with small long build-up. Bank Nifty Open Interest is at 17,08,360 up by 5,13,120, with increase in price, mostly roll-over with small short covering. FII’s bought 1245 contracts of Index Futures, which includes net 107137 contracts long liquidation and 79066 contracts short covering, with decrease in net OI by 186203 contracts, includes 64918 longs to 63673 shorts for the day. FII’s Index future open contract as on date is 249117 Longs to 32825 Shorts, Net long 216292 contracts. Initial support at 8600, with huge OI addition of 10.70 lacs and below that at 8500 with OI of 36.57 lacs. Initial resistance at 8700, with OI of 23.73 lacs and above that at 8800 with OI of 29,73 lacs. Day Range as per Option Table is 8600 - 8715 and as per VIX is 8598 - 8735 with 8655 as the Pivot. The index opened flat to positive and went up to make a new 52 week high but profit booking saw the index close just above 8600 at 8615.80, gain of 25.15 points. The broader market was flat with 796 advances to 807 declines. Range for expiry at 8500-8700. 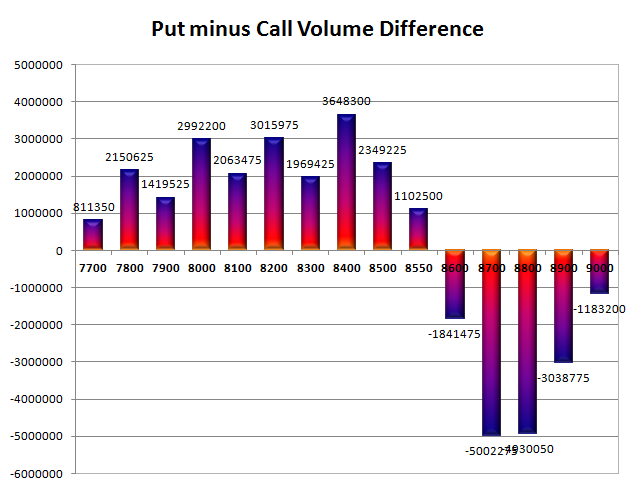 Call option 8650-8700 added 11.70 lacs OI with short covering at 8500 and below strike prices. Put option 8600-8500 added 12.59 lacs OI with profit booking at 8400 and below strike prices. 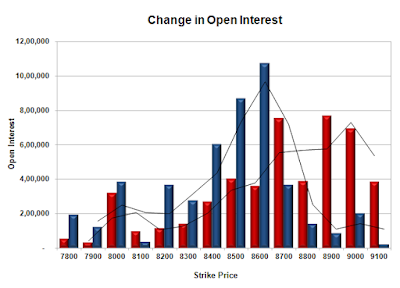 Nifty Open Interest is at 1,76,61,225 down by 27,58,350, whereas next series added 47.58 lacs with increase in price, 100% roll-over with huge long build-up. Bank Nifty Open Interest is at 13,05,000 down by 2,39,320, whereas next series added 2.82 lacs with increase in price, 100% roll-over with long build-up. FII’s bought 964 contracts of Index Futures, which includes net 14934 contracts long build-up and 13970 contracts short build-up, with increase in net OI by 28904 contracts, includes 102123 longs to 101159 shorts for the day. FII’s Index future open contract as on date is 356254 Longs to 111891 Shorts, Net long 244363 contracts. Initial support at 8600, with huge OI addition of 7.88 lacs and below that at 8500 with OI of 53.26 lacs. Initial resistance at 8650, with OI of 31.03 lacs and above that at 8700 with OI of 61,76 lacs. 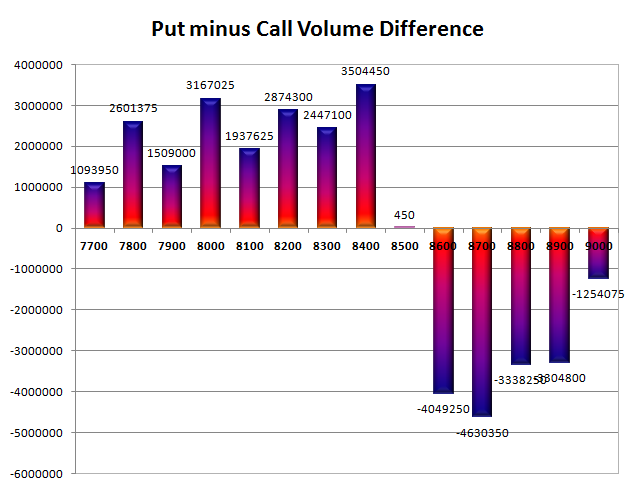 Day Range as per Option Table is 8555 - 8675 and as per VIX is 8546 - 8685 with 8618 as the Pivot. The index opened flat and stayed in a narrow range for the better part of the day, only to see strong down move in the last 30 mins of trade to close at 8590.65, loss of 45.00 points. The broader market was weak with 538 advances to 1075 declines. Range till expiry at 8400-8700. 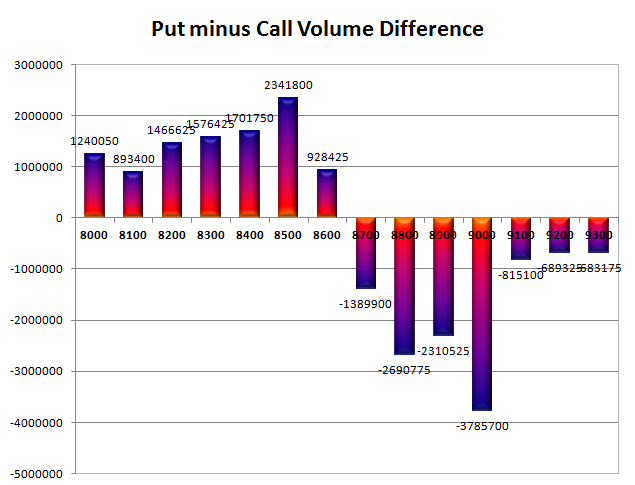 Call option 8800-9000 added 13.92 lacs OI with short covering at 8550 and below strike prices. 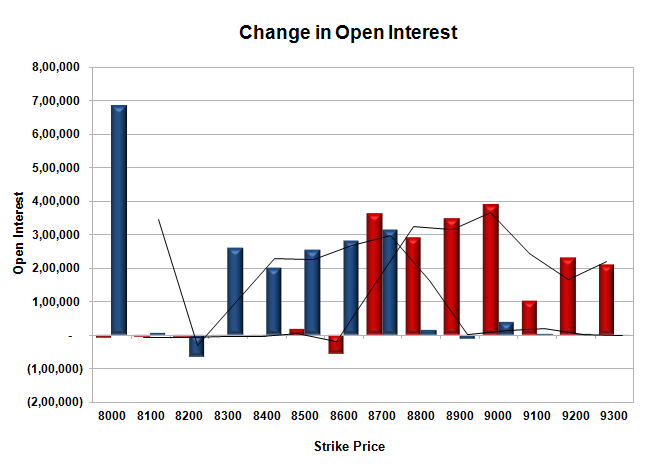 Put option 8200-8100 added 1.00 lacs OI with short covering at 8550 and above strike prices. Nifty Open Interest is at 2,04,19,575 down by 10,09,875, whereas next series added 61.67 lacs with decrease in price, 100% roll-over with huge short build-up. Bank Nifty Open Interest is at 15,44,320 down by 2,40,040, whereas next series added 3.62 lacs with decrease in price, 100% roll-over with huge short build-up. FII’s bought 5786 contracts of Index Futures, which includes net 39109 contracts long build-up and 33323 contracts short build-up, with increase in net OI by 72432 contracts, includes 130915 longs to 125129 shorts for the day. FII’s Index future open contract as on date is 341320 Longs to 97921 Shorts, Net long 243399 contracts. 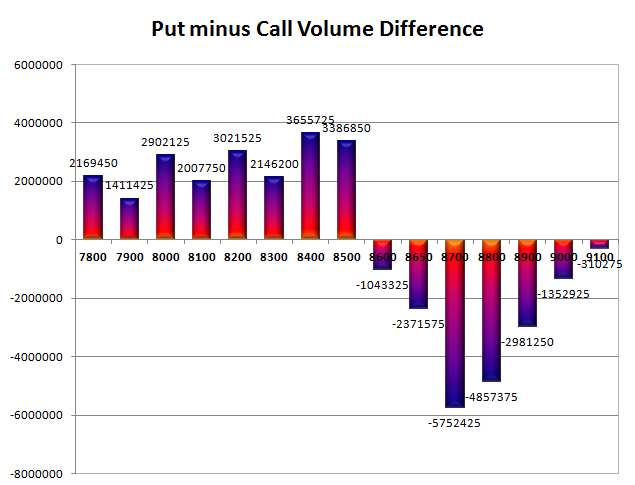 Initial support at 8500, with OI of 48.55 lacs and below that at 8400 with OI of 50.28 lacs. Initial resistance at 8600, with OI of 44.88 lacs and above that at 8700 with OI of 56,42 lacs. Day Range as per Option Table is 8542 - 8659 and as per VIX is 8520 - 8661 with 8604 as the Pivot. The index opened negative but saw huge buying interest from the morning itself and went on to close above 8600 at 8635.65, gain of 94.45 points. The broader market was strong with 1078 advances to 528 declines. Range till expiry at 8500-8700. 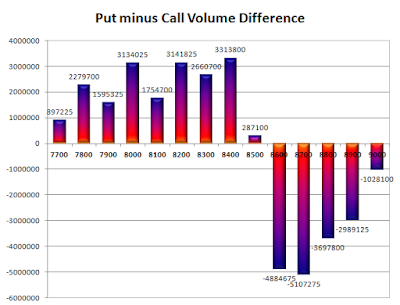 Call option 8700 added 3.44 lacs OI with short covering at 8600 and below strike prices. Put option 8700-8500 added 21.75 lacs OI with profit booking at 8400 and below strike prices. 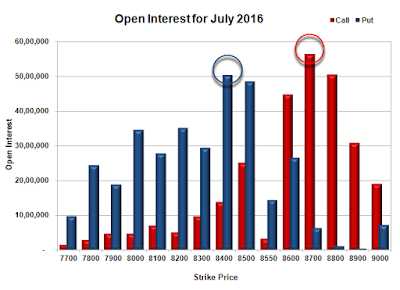 Nifty Open Interest is at 2,14,29,450 down by 18,33,450, whereas next series added 31.86 lacs with increase in price, 100% roll-over with huge long build-up. Bank Nifty Open Interest is at 17,84,360 down by 1,52,880, whereas next series added 1.93 lacs with increase in price, 100% roll-over with long build-up. FII’s sold 4160 contracts of Index Futures, which includes net 7467 contracts long build-up and 11627 contracts short build-up, with increase in net OI by 19094 contracts, includes 70107 longs to 74267 shorts for the day. FII’s Index future open contract as on date is 302211 Longs to 64598 Shorts, Net long 237613 contracts. Initial support at 8600, with huge OI addition of 12.45 lacs and below that at 8500 with OI of 57.67 lacs. 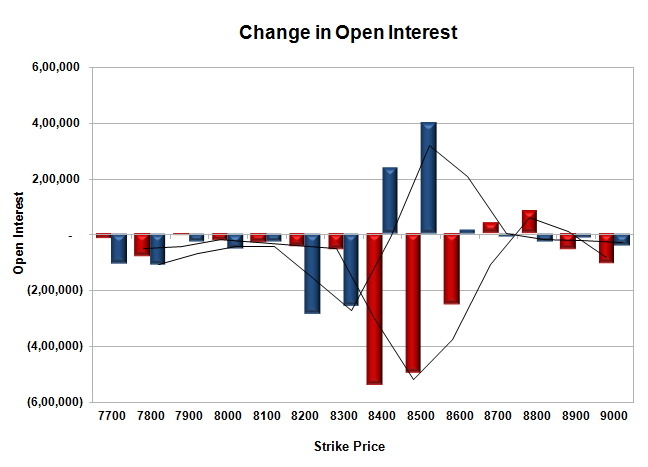 Initial and best resistance at 8700, with OI of 61.35 lacs. Day Range as per Option Table is 8548 - 8667 and as per VIX is 8565 - 8707 with 8598 as the Pivot. The index opened flat to positive and after an initial dip saw buying interest to close near the highs of the day at 8541.20, gain of 31.10 points. The broader market was positive with 945 advances to 647 declines. Range back to 8400-8700. Call option 8700-8800 added 1.24 lacs OI with short covering at 8500 and below strike prices. Put option 8500-8400 added 6.39 lacs OI with profit booking at 8300 and below strike prices. 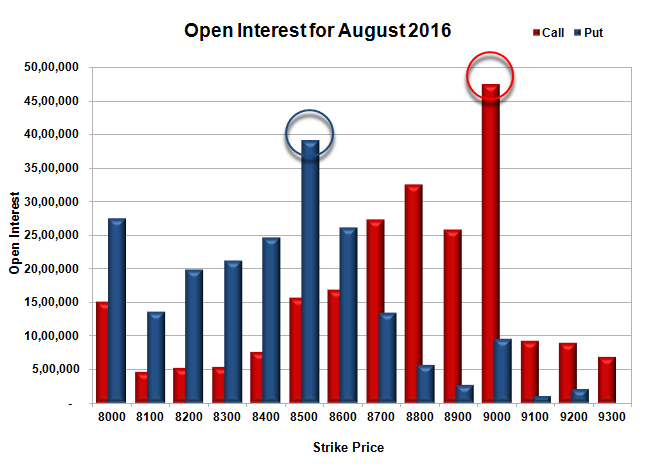 Nifty Open Interest is at 2,32,62,900 up by 1,35,075, whereas next series added 5.85 lacs with increase in price, probably huge long build-up. 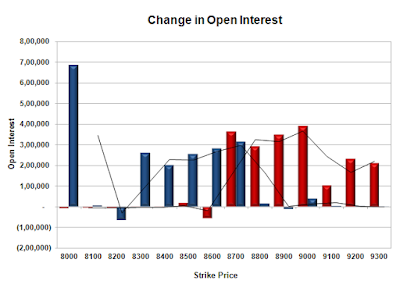 Bank Nifty Open Interest is at 19,37,240 down by 1,77,440, whereas next series added 0.75 lacs with increase in price, probably short covering with small roll-over. 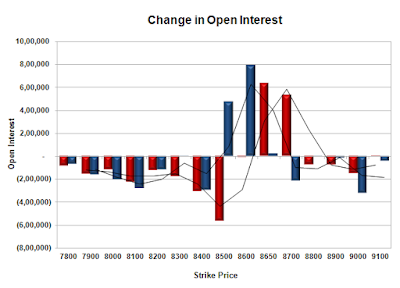 FII’s bought 8421 contracts of Index Futures, which includes net 8991 contracts long build-up and 570 contracts short build-up, with increase in net OI by 9561 contracts, includes 33888 longs to 25467 shorts for the day. FII’s Index future open contract as on date is 294744 Longs to 52971 Shorts, Net long 241773 contracts. Initial support at 8500, with OI of 49.72 lacs and below that at 8400 with OI of 58.75 lacs. Initial and best resistance at 8600, with OI of 61.76 lacs and above that at 8700 with OI of 57.92 lacs. 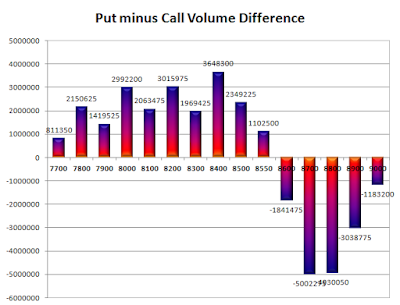 Day Range as per Option Table is 8475 - 8584 and as per VIX is 8472 - 8610 with 8527 as the Pivot. The index opened positive but profit booking from the onset saw the index close weak near the lows of the day at 8510.10, loss of 55.75 points. The broader market was weak with 585 advances to 1018 declines. Range back to 8400-8600. Call option 8400-8800 added 15.00 lacs OI with profit booking at 8900 and above strike prices. Put option 8200-8100 added 3.62 lacs OI with short covering at 8500 and above strike prices. 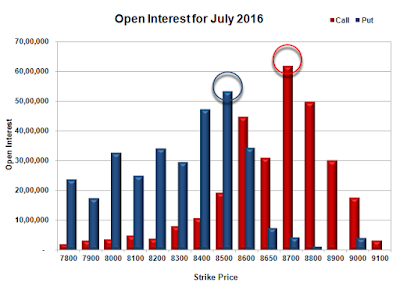 Nifty Open Interest is at 2,31,27,825 down by 3,92,700, with decrease in price, probably long liquidation. Bank Nifty Open Interest is at 21,14,680 down by 2,09,800, with decrease in price, probably huge long liquidation. FII’s bought 4910 contracts of Index Futures, which includes net 6308 contracts long build-up and 1398 contracts short build-up, with increase in net OI by 7706 contracts, includes 24846 longs to 19936 shorts for the day. FII’s Index future open contract as on date is 285753 Longs to 52401 Shorts, Net long 233352 contracts. 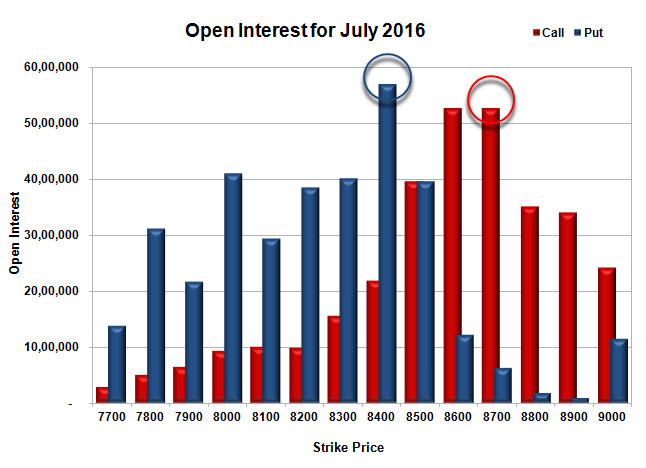 Initial support still at 8500, with OI of 45.71 lacs and below that at 8400 with OI of 56.37 lacs. 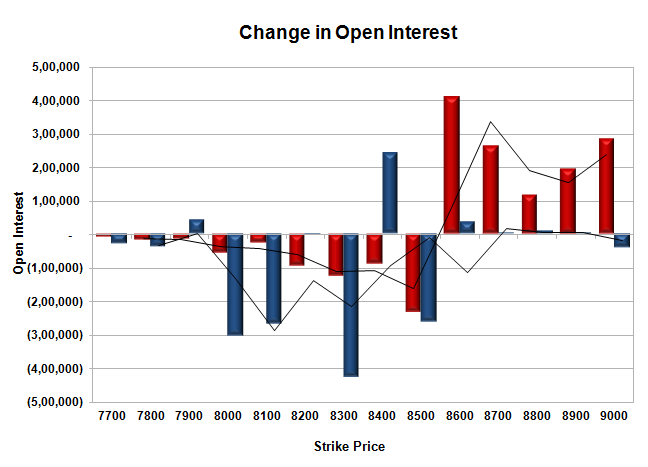 Initial and best resistance at 8600, with OI of 64.28 lacs and above that at 8700 with OI of 57.51 lacs. Day Range as per Option Table is 8469 - 8583 and as per VIX is 8440 - 8580 with 8533 as the Pivot. The index opened weak at 8515.45 but saw buying interest from the onset to close near the top of the day at 8565.85, gain of 37.30 points. The broader market was strong with 1074 advances to 519 declines. Range for the series at 8400-8700. Call option 8700-8800 added 2.75 lacs OI with short covering at 8500 and below strike prices. Put option 8600-8200 added 12.69 lacs OI with profit booking at 8100 and below strike prices. 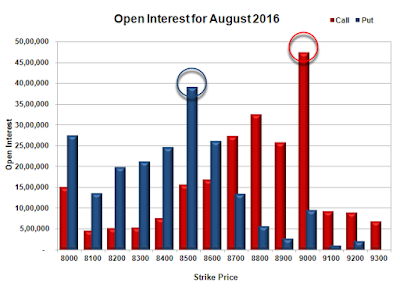 Nifty Open Interest is at 2,35,20,525 up by 6,21,450, with increase in price, probably long build-up. 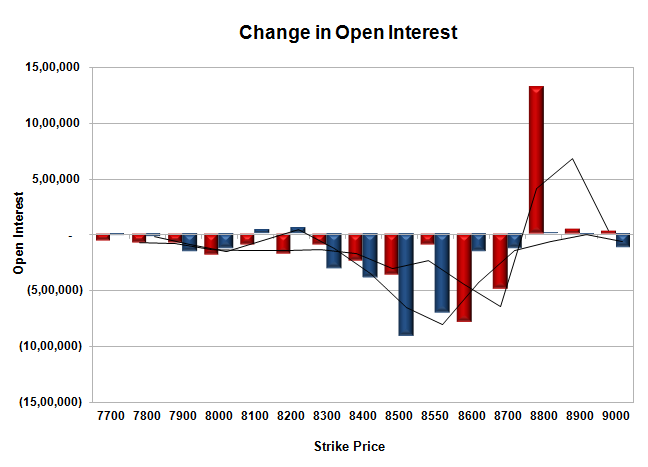 Bank Nifty Open Interest is at 23,24,480 down by 1,120, with increase in price, probably short covering. 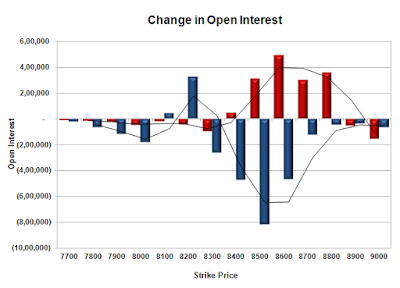 FII’s bought 941 contracts of Index Futures, which includes net 3555 contracts long build-up and 2614 contracts short build-up, with increase in net OI by 6169 contracts, includes 19780 longs to 18839 shorts for the day. FII’s Index future open contract as on date is 279445 Longs to 51003 Shorts, Net long 228442 contracts. Initial support getting better at 8500, with OI of 53.90 lacs and below that at 8400 with OI of 61.14 lacs. 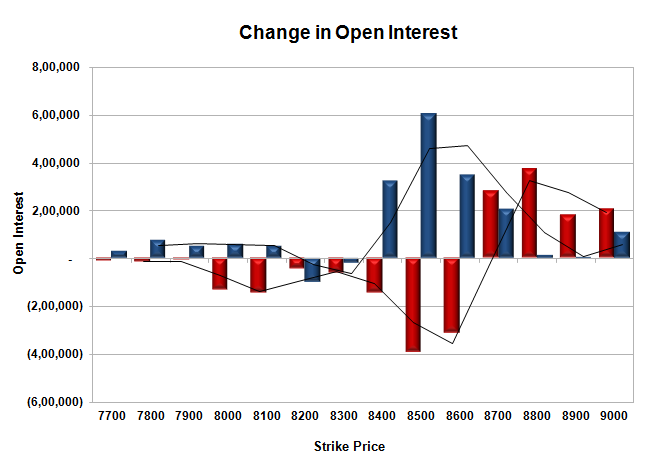 Initial and best resistance at 8600, with OI of 59.40 lacs and above that at 8700 with OI of 54.52 lacs. Day Range as per Option Table is 8497 - 8609 and as per VIX is 8494 - 8638 with 8549 as the Pivot. The index opened flat at 8514 and stayed within a narrow range, but dipped to the lows of the day around 8476.70 but saw the buyer back in action to close strong at 8528.55, gain of 19.85 points. The broader market was weak with 695 advances to 906 declines. Range for the series stays at 8400-8600. Call option 8400-8800 added 5.16 lacs OI with profit booking at 8900 and above strike prices. Put option 8600-8300 added 10.56 lacs OI with profit booking at 8200 and below strike prices. 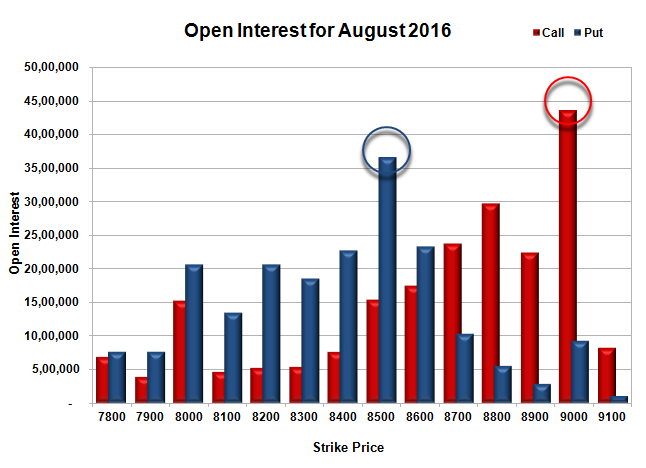 Nifty Open Interest is at 2,28,99,075 up by 5,19,375, with increase in price, probably long build-up. 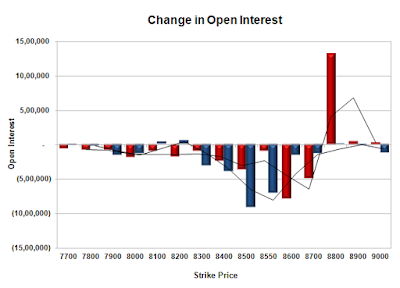 Bank Nifty Open Interest is at 23,25,600 down by 55,040, with decrease in price, probably long liquidation. FII’s bought 8435 contracts of Index Futures, which includes net 9104 contracts long build-up and 669 contracts short build-up, with increase in net OI by 9773 contracts, includes 26107 longs to 17672 shorts for the day. 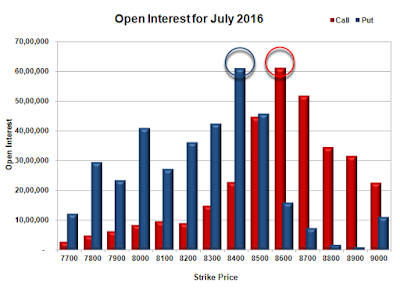 FII’s Index future open contract as on date is 275890 Longs to 48389 Shorts, Net long 227501 contracts. Initial support still at 8500, with OI of 45.79 lacs and below that at 8400 with OI of 61.03 lacs. 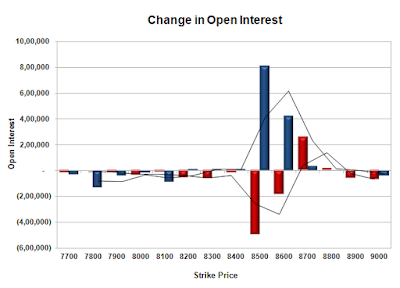 Initial and best resistance at 8600, with OI of 61.25 lacs and above that at 8700 with OI of 51.91 lacs. Day Range as per Option Table is 8458 - 8579 and as per VIX is 8457 - 8600 with 8515 as the Pivot. The index opened flat at 8565 and went on to touch the highs of the days within the first few minutes. Profit booking saw the index dip below PDC and stayed weak to close at 8541.40, loss of 23.60 points. The broader market was weak with 532 advances to 1072 declines. Range for the series now at 8400-8700. 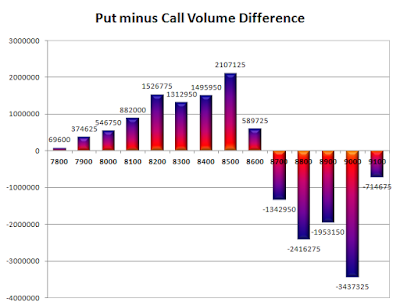 Call option 8600-9000 added 12.73 lacs OI with short covering at 8500 and below strike prices. Put option 8400 added 2.43 lacs OI with profit booking at 8300 and lower strike prices. Nifty Open Interest is at 2,25,19,425 up by 4,58,475, with decrease in price, probably short build-up. Bank Nifty Open Interest is at 23,95,160 up by 42,000, with increase in price, probably long build-up. FII’s bought 11406 contracts of Index Futures, which includes net 12790 contracts long build-up and 1384 contracts short build-up, with increase in net OI by 14174 contracts, includes 31120 longs to 19714 shorts for the day. FII’s Index future open contract as on date is 257243 Longs to 50951 Shorts, Net long 206292 contracts. Initial support still at 8500, with OI of 39.69 lacs and below that at 8400 with OI of 56.99 lacs. 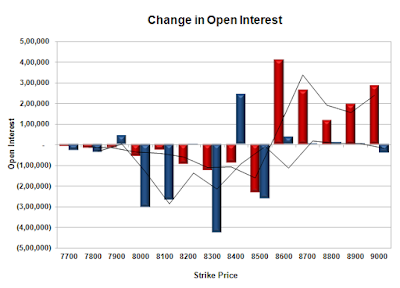 Initial resistance at 8600, with OI of 52.72 lacs and above that at 8700 with OI of 52.73 lacs. 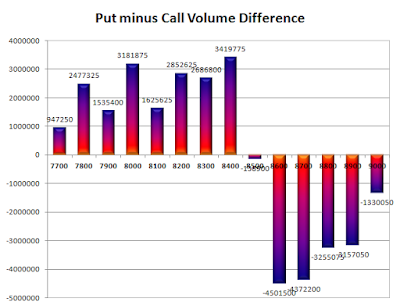 Day Range as per Option Table is 8486 - 8605 and as per VIX is 8471 - 8611 with 8549 as the Pivot. The index opened flat at 8516 and stayed in a narrow range for the first few hours only to see huge long build-up to close near the highs of the day at 8565.00, gain of 45.50 points. The broader market was strong with 1000 advances to 617 declines. Range for the series stays at 8200-8700. 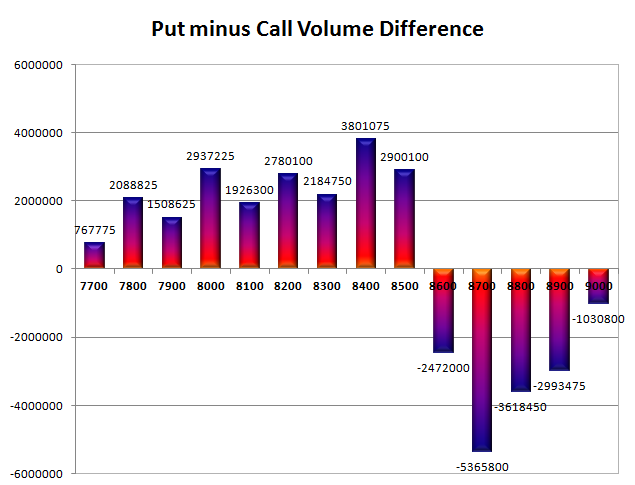 Call option 8700-9000 added 10.43 lacs OI with short covering at 8500 and below strike prices. Put option 8700-8400 added 14.78 lacs OI with profit booking at 8300-8200 strike prices. 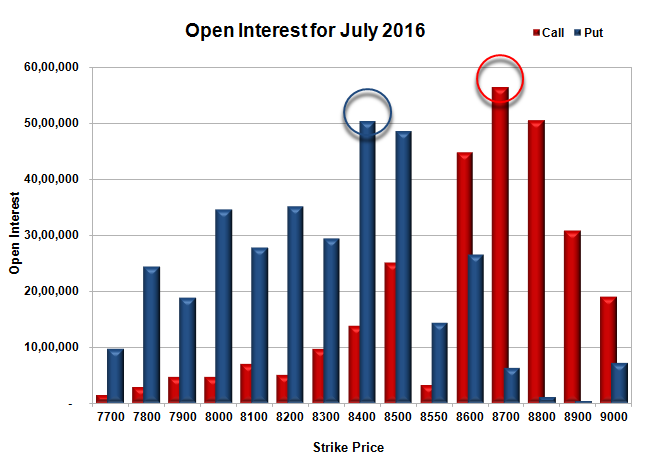 Nifty Open Interest is at 2,20,60,950 up by 6,24,450, with increase in price, probably long build-up. 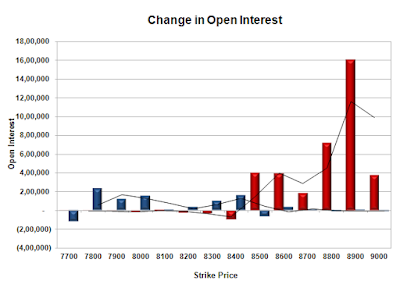 Bank Nifty Open Interest is at 23,53,160 up by 1,31,920, with increase in price, probably huge long build-up. 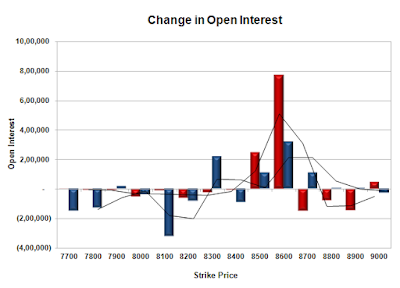 FII’s bought 6811 contracts of Index Futures, which includes net 7903 contracts long build-up and 1092 contracts short build-up, with increase in net OI by 8995 contracts, includes 22072 longs to 15261 shorts for the day. FII’s Index future open contract as on date is 244453 Longs to 49567 Shorts, Net long 194886 contracts. Initial support at 8500, with OI of 42.30 lacs and below that at 8400 with OI of 54.55 lacs. 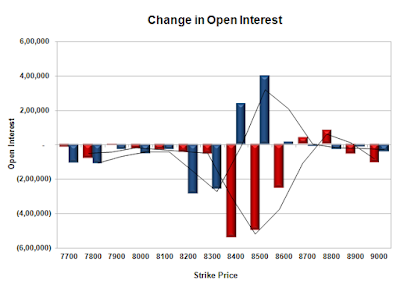 Initial resistance at 8600, with OI of 48.62 lacs and above that at 8700 with OI of 50.07 lacs. 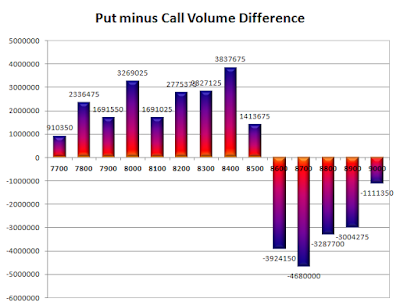 Day Range as per Option Table is 8490 - 8609 and as per VIX is 8495 - 8635 with 8546 as the Pivot. The index opened up at 8540 and went on to make a high of 8550 but profit booking from higher levels saw the index close flat at 8519.50, small loss of 1.55 points. The broader market was weak with 507 advances to 1110 declines. Range for the series stays at 8200-8700. 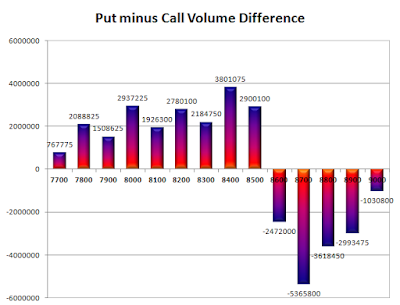 Call option 8500-9000 added huge 36.76 lacs OI with short covering at 8400 and below strike prices. Put option 8400-7800 added huge 7.85 lacs OI with profit booking at 7700 and below strike prices. Nifty Open Interest is at 2,14,36,500 up by 1,79,700, with no change in price, probably long/short build-up. 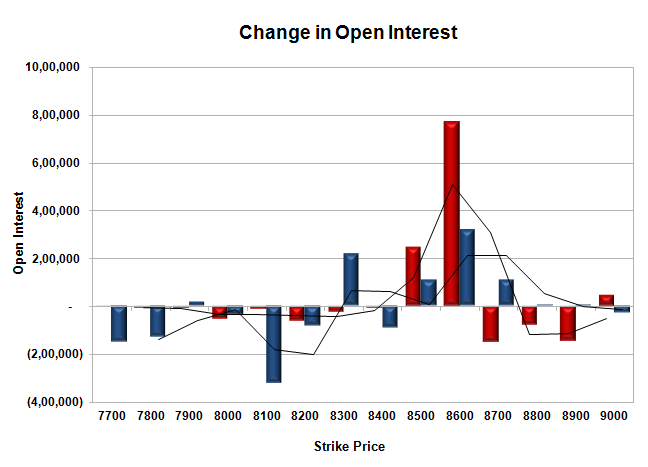 Bank Nifty Open Interest is at 22,21,240 down by 3,800, with decrease in price, probably long liquidation. FII’s bought 10573 contracts of Index Futures, which includes net 10300 contracts long build-up and 273 contracts short covering, with increase in net OI by 10027 contracts, includes 31304 longs to 20731 shorts for the day. FII’s Index future open contract as on date is 236550 Longs to 48475 Shorts, Net long 188075 contracts. 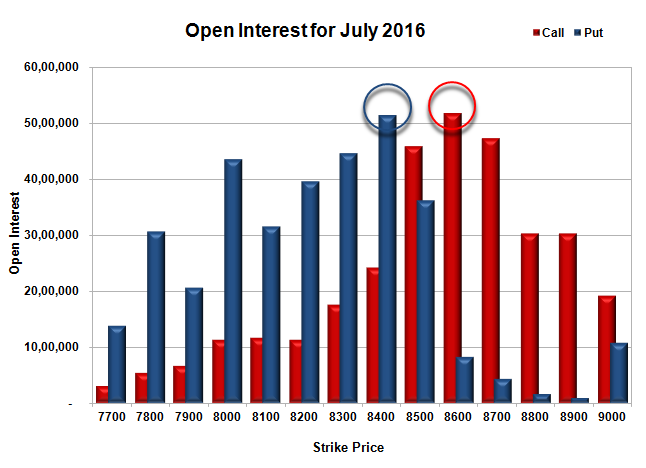 Initial support still at 8500, with OI of 36.28 lacs and below that at 8400 with OI of 51.34 lacs. Initial and best resistance at 8600, with OI of 51.75 lacs and above that at 8700 with OI of 47.25 lacs. Day Range as per Option Table is 8458 - 8582 and as per VIX is 8451 - 8588 with 8521 as the Pivot.